The most popular form of entertainment was music and storytelling. It was a social skill that few of us today can muster, however a thousand years ago it was the expected norm at any gathering what ever it's size. There were many stories of ancient heroes such as the tale of 'Beowulf' or the Norse Sagas. Few of these survive today as they were generally passed on by word of mouth and were very rarely written down. Most of those which were recorded are in the form of a poem. Often these poems were composed to record a particular event such as 'The Battle of Maldon', others, such as 'Widsith' and 'Deor' appear to be fiction or folklore. Much history and custom was passed on by word of mouth. It is easier to remember things exactly when in the form of poetry than as prose. Therefore history was often recorded in the form of poetry. In Turkey and the Middle East, it is still possible to find story tellers who travel from one cafe or bar to another entertaining the customers with tales of great daring do and heroism (usually a man, no surprise there.). These stories are well known by the audience, who can recite the chorus part of the tales just as well as the Bard. The most suprising aspect of these stories is their length and the detail recalled by the Bards, with the performance lasting at least a couple of hours. Often, the Bard begins the story in a formulaic form, just as we have 'Once upon a time...', and then he starts the first installment, when he reaches a natural break in the tale, he resorts to his trusty, in this case a style of 'Gusli', to strum out the chorus, and here the crowd joins in. At this point, the Bard is actually recalling the next section, and when the chorus is finished, he continues. There are occasions where there are two Bards sharing the telling in rotation, enabling an even more embellished tale to be told. This is mearly a present day example, and should not be taken as a gospel version of how Anglo-Saxon verse was recited, but it may have been like this. In Saxon England there were professional storytellers, called 'scops', who would travel from village to village telling tales in return for food, lodging and money. A good scop was a respected member of the community and could be well rewarded for his skill. A scop could also use music to emphasise parts of the story, or as 'background music'. 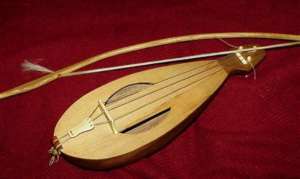 Indeed, another word for a poet or storyteller was 'hearpere' (harper), implying the use of this instrument (or the lyre it developed from) for this person. Even today we still use the phrase 'to harp on' when someone is being particularly verbose. The surname Harper may also date back to this period. It is even quite likely that many of the 'heroic lays' were actually told by singing or chanting, rather than just speaking them. A particular feature of much Anglo-Saxon verse is the use of 'kennings'. A kenning is almost like a riddle within the verse, describing an object in an unusual way, for example the sea becomes the 'swan's road', a ship is a 'steed of the waves', the human body is a 'bone-house', etc.. The Vikings also had their own professional poet/storytellers, known as Skalds. They composed and recited poems in a fairly simple verse form which relied heavily on alliteration and also the use of kennings. Most Skaldic poetry was written for a particular occasion, and often praised the heroic virtues. The Vikings also had stories known as 'Sagas'. These sagas often recounted the lives of famous people and great heroes, although others were about more everyday types. The one thing they all had in common was that they almost always tried to make some point about society or demonstrate how people should or should not behave, much as Aesop's moraistic fables did. Elements of Aesops fables can be found in the footing strips of the Bayeux Tapestry. Singing and music were prized skills even without the telling of stories or poetry, and again there were professional musicians, called 'gleemen', who like the scop would travel from place to place and play and sing in return for pay. Like the scop, a skilled gleeman might be appointed as a court musician. It seems that skill at music was also regarded as a good kingly skill, with musical instruments included in many royal burials of the pagan period, and representations of King David playing the harp being a popular theme in Anglo-Saxon art such as the example at the top of the page. It all ended happily though, as God inspired him one evening and he composed a hymn that was a great success. So grateful was he to God that he became a monk. Few actual musical instruments, apart from bone whistles, have survived from the period although there are quite a lot of manuscript illustrations showing them. The commonest type of stringed instrument to have survived is the lyre (O.E. hearpe, citere). These have been found in England at royal burials such as Taplow and Sutton Hoo as well as the less grandoise burials at Bergh Apton, Morning Thorpe and Abingdon. They are also known from Cologne, Oberflacht and Kerch, and Hedeby in Germany as well as on numerous contemporary manuscript illustrations. Bridges for the instrument have also been found at places as far apart as York and Sweden. The lyre seems to have always been six stringed, but how it was played and tuned will have to remain a mystery. It is possible that each string was tuned to a different note and then just plucked, although the tunes would be severely limited with less than an octave range, or it may have been that a number of strings were used for chords and drones, whilst others had their note changed by applying pressure to the back of the string and then plucking for the melody. However it was played there seems to be a peculiarly English convention of reinforcing the top tenon joints with a decorative plaque, usually of bronze, riveted through the joint. This served not only to strengthen the joint but also to decorate the lyre. The instrument itself was made of wood, with gut or horsehair strings. The pegs, bridge and tail-piece could be of wood or bone. The true harp (O.E. hearpe, gamenwudu) seems to have started to appear in England in the late ninth or early tenth century, although it may have been known earlier in Scotland and Ireland. Although there are no surviving harps from the period there are numerous pictorial representations of them. Most of the harps illustrated are shown with only twelve strings, giving a range of an octave and a half, about the same as an untrained human voice. Gauging how big and the number of strings harps of the period had is tricky. Original images of harps are misleading and sometimes show the strings strung from the wrong section of the harp altogether. It is possible of course that the harps had more strings than this (indeed some illustrations show more or less than twelve), although the twelve stringed harp may have been the type that would be passed around the hall after feasting, where generally it would be used to accompany untrained voices. Those harps used by scops and gleemen may have had more strings, possibly 20 or so for use with better trained voices. Like the lyre, the harp would have been made with wood, with bone or perhaps metal pegs. The strings would probably have been gut or horsehair, although bronze wire strings may also have been used. There is a suggestion that the bronze strings were an Irish tradiotn, with gut strings being the more usual form in England. Unlike modern harps, the soundbox would have be hollowed out from a single piece of wood and finished with a thin panel to 'seal' the sound box. They were not built by box or stave construction and neither would it have had pedals or semi-tone levers as found on modern harps. The Rebec, a violin type instrument, seems to have first appeared in the late tenth or early eleventh century. The only known example from this period comes from a fragmentary find from Hedeby, although there are some pictorial representations, and is possibly the instrument referred to by the Old English word fiðele (Fiddle). The Fiddle may though have been simply a higher pitched instrument witha shallower sound box. 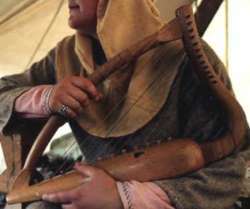 Materials for the Rebec would be much the same as for the harp or lyre, although the Rebec has only three strings. 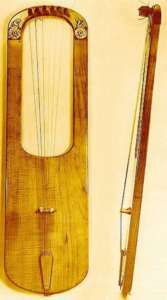 Like the harp the Rebec would have a soundbox carved from a single piece of wood. The rebec was played with a bow, probably of wood and horsehair. The only aspect of the Rebec which has yet to be addressed for certain is it's lack of a finger board just behind the neck of the instrument. 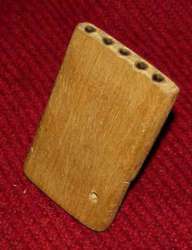 Medieval examples do have the fingerboard, allowing a wide range of notes to be played, however without this piece, the Rebec becomes a five 'note' instrument, possibly being used purely as an accompaning drone. Another stringed instrument mentioned quite often is the cithara. The cithara may well be the forerunner of the guitar, which it sounds like when spoken, and is the Spanish or Moorish tradition of the same instrument except for it's flat back. In the Eastern half of the Mediterranian, the same instrument 'gets' a much deeper sound box and becomes the Lute, from the Arabic word and string instrument 'El Ud', with the likelihood that the Ud was the template for both these later instruments. Others are the monocord (a single string pulled taught over a sound box and a moveable bridge that was plucked to help choir boys train their voices); and the organistrum (a form of primitive hurdy gurdy). 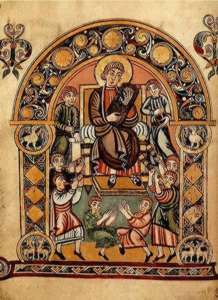 Others such as psalteries or dulcimers (O.E. sealm-glig) may have been in use, although there is only some evidence for these prior to the Norman Conquest. There was a variation of the lyre called a rotta in use at the time which was also a stringed instrument. Lutes and guitars however are much later types of instruments and were totally unknown in this period, although a guitar like instrument with a solid body is shown in some manuscripts. By far the most commonly found musical instrument on archaeological digs is the bone whistle (O.E. hwistle, pipe, sangpipe). These are always end blown (like a penny whistle, not a flute) and have a variable number of finger holes, from none to six, although two and three holed examples are the most common. The reason for this could be that, like the later tabor pipe, they were designed to be used with one hand whilst the other hand was used to play a second instrument, or it could just be that it was only used for simple tunes. Reed whistles were also known as were wooden whistles, although these tend not to be preserved on archaeological sites. The instrument most people think of in connection with the Vikings is the blasting horn or trumpet (O.E. blaedhorn, blaeshorn, bleme, horn, sarga). This instrument was certainly used by both Viking and Saxon, although not just for music - it was used when hunting and on the battlefield too. Usually these would be of ox or goat horn, although wooden examples are known. Many horns were decorated with cast or incised metal mounts. A few of the horns actually had finger holes cut in them in order to play tunes on them, although this is not really necessary as a skilled horn player can play a tune on a horn with no finger holes. From York come some box-wood pan pipes (O.E. pipe, sangpipe), and these may well have been a fairly common type of instrument, although we have, as yet, no further examples. They do, however, appear in some manuscript illustrations. Bagpipes are known from literary sources, although there have been no finds of them. In appearance they were probably more like Northumbrian small pipes or Irish bagpipes rather than the modern Scottish variety. There are two components other than the bag which set the Bagpipes from other instruments, the reed chanter and the drone pipes. The appearence of the reed which gives the pipes their high 'squawking' is a matter as yet of conjecture, and the number if any of drones, has also yet to qualified. The organ (O.E. organa) was also known, both in a fixed form for large churches and Cathedrals, as well as a portative form, which may have been used for secular as well as clerical music. The portative type of organ could have been as small as an old typewriter, and just as easy to carry. Winchester Cathedral reputedly had the largest organ in Northern Europe, and there are references to organs that necessitated a team of sixteen men or boys on the bellows to keep it running. The Harley psalter shows a number of people pumping the bellows of just such an organ. These organs were played only with sliding stops, not a keyboard like a modern organ. Both hydraulic and pneumatic organs were known and used at this time. There has been one find of a fragmentary organ that has been identified as a Water Organ from the Padaborn region of Northern Germany. The water in this case is not part of the musical process, but a method of controlling the consistant and steady flow of air to the organ pipes. It's possible that a form of shawm (a type of medieval oboe) arrived in this country in the fifth century (the same time as the early Saxon settlers) and so may have been a Saxon 'import' from the continent, although this is fairly speculatory. 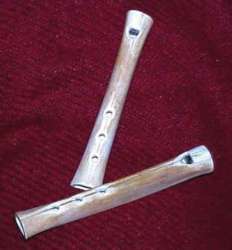 The simple wooden or reed form of the transverse flute may have also been used in addition to the more regular end blown flutes or whistles. The drum as we all would recognise, has never been found in Europe from this period, which begs the question as to what they used as bass precussion. A form of drum known as a hylsung was used, but what it looked like and how it was played cannot be certain. It is possible that it was similar to the Irish bodhram since this is a very ancient form of drum, or it could have been stave built similar to a medieval long drum. The only clue we have is a Spanish illustration showing the devil playing what seems to be a double ended drum, on it's side in the Arab fashion. This may indeed be a savage satire of Arab players by Christian witnesses, and not an example of a drum of this type in Europe. Bells (O.E. belle, clucge, handbelle) are known and were probably used for music as well as for churches and animals. A magnificent example of a church bell was excavated at Hedeby in Northern Germany. A section of a wooden hanger (the hinge on which it would have swung) was located as well. The replicated example is now hung and erected in it's own bell 'booth' just outside the museum buildings. A trio of bell ringers (although they only have a pair of bells between them....) can be seen on the Skog tapestry from Sweden. It seems that church bells were on the whole installed either in a completely serperate 'tower' (such as in the Skog tapestry) or in one of the simple booths, rather than hung directly in the cxhurch. Quite why this is, is unclear. Even in the case of animal bells there are modern European traditions of deliberate pitch selection on the part of herdsmen and often for shepherds not only to tune the bells of their flock to a distinct scale, but to adjust their own pipes accordingly, providing a rough but tuneful accompaniment to their own playing. Bells were made either from folding a sheet of iron or bronze into a square or round beehive shape and fixing it with rivets, or by casting a similar shape in bronze. Small cast bells that never had a clapper fitted inside were possibly worn to help to 'announce' the presence of the wearer. This was done as a courtesy to other travellers and villagers - as it would alert others of their innocent approach, whereas (it is implied) only outlaws would wish to be silent. The Mastermyr find in Denmark yielded a pair of folded iron bells including their clappers (the part that swings inside the bell), either true hand bells or for strapping around cattle necks. Replicated versions of these bells suggests that they were less than tuneful and were indeed intended for livestock. Stray finds from other sites include crude but effective miniature folded copper alloy or iron bells. Sets of bells suspended from a bar are illustrated in some manuscripts, which were in all likelihood struck with a wooden hammer. Other percussion instruments probably included bones (played like spoons) and finger cymbals and tong cymbals (O.E. cimbal) or simple improvised instruments. Clapping would certainly have been used for percussion. We also have written references to 'rattle-sticks' (O.E. cladersticca), although it is not clear whether these are percussion instruments, or whether they are perhaps just a baby's rattle. What the music sounded like is more difficult to work out as, on the few occasions it was written down, the system of musical notation was different from that used today. 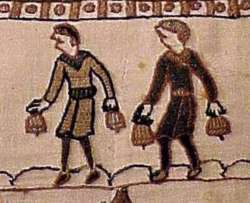 Some tunes are known today which may be from the period, and those that were written down shortly after the Norman conquest are in all likelihood very similar to those played before it. Many of the songs to have survived are hymns or other religious works, although a few 'folksongs' may have survived, since there are a few songs in Old English written down after the Norman Conquest. As well as songs telling of famous events and people there were probably working songs sung whilst performing everyday jobs, just as sea shanties or spirituals used to be. Within the Old English language there are words for both 'sea or ship-songs' and 'war or battle-songs', the latter probably being a marching song. There were also probably simple tunes, similar to nursery rhymes for the children. The life of the Anglo-Saxons and the Vikings for that matter was probably filled with tunes and music wherever they worked and lived - from the more formal pieces to the everyday when men could be found just singing tunes to the cattle as they milked. The cattle themselves probably carried folded sheet bells at their necks, so that not even the fields would have been silent. Click here to return to the village. Click here to return to the manor of Drengham. Last updated 10 December, 2002 . Article by Roland Williamson 1999. Click here to return to the main page or the listing. © Regia Anglorum Publications 2002.